The public is invited to visit the Shoreditch Art Wall on Great Eastern Street, London,EC2, to see VISION artists' with disabilities, and ACTION FOR CHILDREN art celebrating London's 2017 World Para Athletics Championships. The artwork will be remain on the Shoreditch Art Wall until Sunday July 23 and can also be viewed at www.murals4mankind.org. July 12, 2017, Shoreditch, London; Today, Peter Mackeonis, of Murals4Mankind.org announced that, in support of the 2017 World Para Athletic Championships, artwork by Vision, artists with disabilities, and Action for Children will be on display on the Shoreditch Art Wall in Shoreditch until July 23rd, 2017. The Para Athletics Championships will take place in London July 14th - 23rd 2017 where over 1,000 athletes will show their prowess. 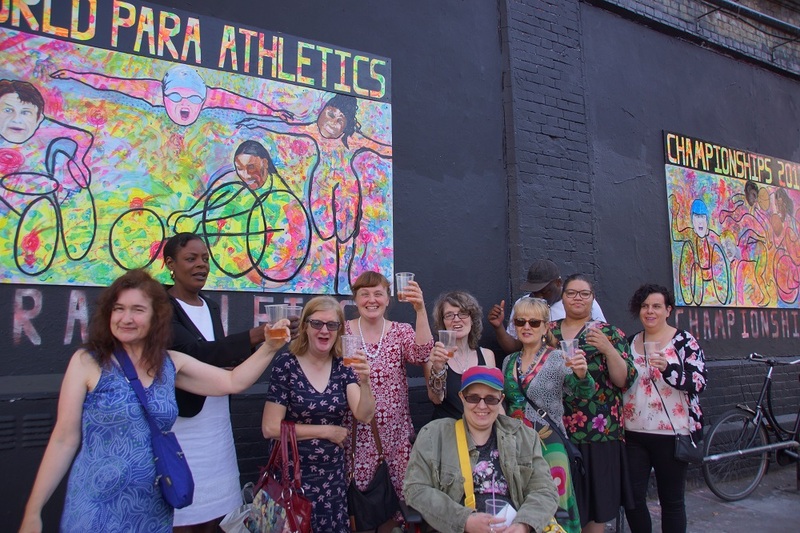 To celebrate the 2017 World Para Athletics Championships, organizer Sarah Hughes brought Vision, a collective of artists, and, Action for Children, together to create a polychromatic visual feast on four large panels, to kick off the Para Athletics games, for the Shoreditch Art Wall. This exceptional group of artists include: Michelle Baharier, Dawn Barber, Dwain Bryan, Julie Cordell, David Elton, Lynda Evans, Lorraine Peacock and Sandra Pink. The Vision panels feature exquisite portraits of famous para athletes by Michelle Baharier, whom also had an advisory role alongside other art specialists. VISION's mission is to inspire artists with disabilities to have an integral voice in their community through their artwork. The 2017 World Para Athletics Championships will will be held across 10 days of competition and include 213 medal events and feature around 1,300 athletes. These Para Athletics Championships are part of London's Summer of World Athletics. Over four awe-inspiring weeks, the world's top athletes will compete in the historic stadium in the Queen Elizabeth Olympic Park. This is the first time, that both the World Para Athletics Championships and the IAAF World Championships will all be held in London. The public is invited to take photographs and post them to the social media to show support for disabled artists in today's society and contributions to support further Murals4Mankind art projects may be paid via PayPal to artists@murals4mankind.org.